The following is a guest editorial written by Park City School District that was published in the Park Record March 6, 2019. As Park City School District transforms our schools to meet the needs of the future, it is critical we examine the ways we prepare and engage students. Our mission is to inspire and support all students equitably to achieve their academic and social potential. How do we know if students are reaching their academic potential? Grades should reflect student proficiency in relation to a specific standard. Standards-based learning (SBL), which has been around since 1983, encourages students to take ownership of their learning. It empowers them to improve understanding of a concept and advocate for multiple ways in which they can demonstrate their knowledge and skills. SBL is a method of providing feedback that separates academic achievement from habits, efforts, and behaviors. It is a more accurate reflection of what a student actually knows and can do. Perhaps one of the most important aspects of SBL is that it encourages students to view learning as an ongoing process that doesn’t end after an assessment. We hope the following information illustrates our student-centered vision and why we believe SBL will help our students feels supported, engaged, and challenged. Three years ago teachers at Ecker Hill Middle School realized that its reporting system needed to be an accurate method that recognized students’ accomplishments and specific needs. Through school visits, research, and professional development, the educators realized SBL was the best way to go to assist students in their growth and achievement. Now three years later, Ecker Hill Middle has piloted the system and fully implemented this school year. The students now receive a composite score of 1, 2, 3 or 4 in each subject which is calculated by averaging the proficiency score for each standard in each subject. A “3” means a student is proficient in that subject. Because SBL was teacher driven at a local school, there has not been district-level coordination until this school year when we realized all our schools were interested in using a consistent system. This year we created two district task forces to assist with educating parents about SBL. Since the remaining schools will not fully implement SBL until 2022, we are in the beginning stages of educating parents districtwide about SBL and its value to students. To date, more than half of Treasure Mountain Junior High teachers are using SBL scales to assess learning and the school plans to fully implement SBL by August 2020. Individual teachers and departments at Park City High have started to use SBL scales. Secondary students will continue to earn a traditional letter grade in a course, and the high school transcript will look the same as it has in the past. The course letter grade will be determined according to a proficiency-based grading scale. Our elementary schools are exploring the use of SBL, developing scales, and some teachers are beginning to assess mastery of standards separately from behavior and work habits. Ultimately, students are the ones who will benefit the most from SBL. The key tenant of SBL is understanding where each student is on the road to mastery, not just at the end of the year, but constantly throughout the year. Parents, if you have questions we invite you to meet with your teachers and/or principal to have your questions answered. More resources and research about SBL is available on our Teaching & Learning website. Assessments play an important role in preparing students for the future. 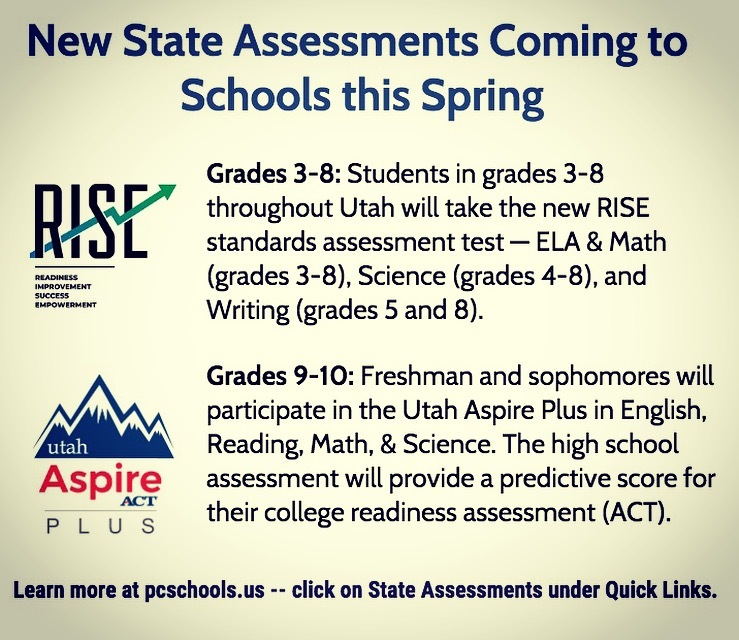 Beginning in April, students in grades 3-8 throughout Utah will take the new RISE standards assessment test. 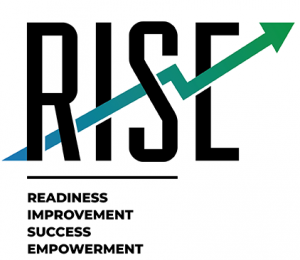 RISE, which replaces SAGE, will offer a baseline for student learning, while ensuring that student growth and proficiency reflect what a student knows and can do. 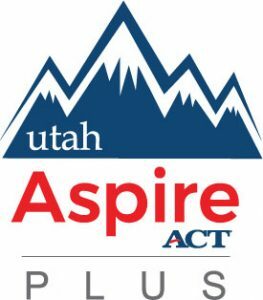 Students in grades 9 and 10 will participate in the Utah Aspire Plus, a high school assessment that provide a predictive score for their college readiness assessment (ACT). Students in grades 3-8 will take RISE assessments in ELA and Math (grades 3-8), Science (grades 4-8), and Writing (grades 5 and 8). The assessment is a multistage computer adaptive criterion referenced assessment system. – A new interface that allows full navigation – backward, forward, review and revise. – New and enhanced reports (for students, teachers and administration). – Writing portion of the tests will now only be for grades 5 and 8. – Test questions are aligned to Utah core standards, utilizing questions developed over the past five years by Utah teachers. – Provides teachers tools to inform their instruction and increase student achievement. Learn more about RISE here. Utah Aspire Plus, which will be given toward the end of the school year, is a custom assessment that aligns to Utah Core Standards. Students will be tested in English, Reading, Math, and Science. Learn more about Utah Aspire Plus here. 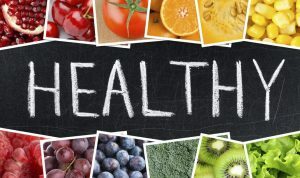 The Park City Board of Education is updating its students wellness policy and is asking the community, parents, students, and educators for feedback. The district is committed to providing a school environment that enhances learning and development of lifelong wellness practices. It recognizes the relationship between adequate nutrition, physical activity and academic achievement. The policy, which can be viewed here, outlines the district’s nutrition programs and promotion, nutrition guidelines for all foods available on campus during the school day, and nutrition education. The wellness policy is posted for its required 20 days during which time the district accepts public comment. Feedback can be sent to Lorie Pearce, lpearce@pcschools.us prior to Dec. 17. The board anticipates adopting the policy at its Dec. 18 regular session. Park City High School custodian Candelario “Cande” Ponce was recognized as Utah’s 2019 Outstanding Education Support Professional of the Year during a surprise assembly at the high school today, Tuesday, Nov. 20. 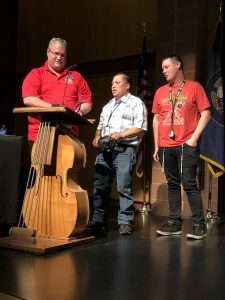 Park City School District administrators along with leaders from both the Utah School Employees Association (USEA) and the Park City Classified Employees Association (PCCEA) joined students and staff in honoring Ponce as their unsung hero. Education support professionals (ESP) are the support staff — clerical services, custodial and maintenance, food services, health and student services, paraeducators, security services, skilled trade services, technical services and transportation services — who work tirelessly to ensure students are healthy, safe, engaged, challenged and supported. As the winner of USEA’s award, Ponce will be Utah’s nominee to the National Education Association’s ESP of the Year. He will attend the national conference in March 2019 in Las Vegas. Ponce will also travel throughout the state to meet members, raise awareness of ESP issues and advocate on their behalf. A father of five, he and his wife own a successful food business open 12 hours a day, seven days a week – all while working full-time as a school custodian. “All who know Cande and his calm and humble way tend to gravitate to him,” says Maryann Gilmore, Area 4 USEA Executive Board member. The ACT is is designed to measure skills needed for success in first-year college coursework. ACT Research has shown that it is the rigor of coursework – rather than simply the number of core courses – that has the greatest impact on ACT performance and college readiness. Some 390 PCHS students took the ACT in 2018, 43,791 students took the ACT statewide, and nearly 2 million students nationwide took the ACT in 2017-18. Student safety and well being is paramount. The Park City community cares about the health and well-being of each student. Park City School District Superintendent Jill Gildea is asking parents to work with the district and law enforcement to ensure safe and drug-free schools remain the norm. Nationally and locally, schools are confiscating a variety of drug paraphernalia including vaping devices. 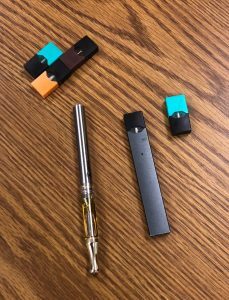 Since the start of the school year, Park City School District staff have recovered drug paraphernalia in a variety of vaping devices (see photo). One such incident occurred today when a 9th grade student was transported to the hospital after a medical incident. The student allegedly smoked THC from a vaping pen. The 9th-grade student who provided the THC was referred to police. 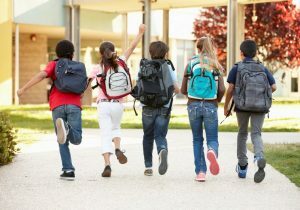 Park City Police remind parents to check their students’ backpacks, bedrooms, and cars for drug and vaping paraphernalia. Those parents who need additional resources related to substance abuse should contact the Summit County Health Department. If anyone locates anything suspicious they should contact law enforcement immediately. Park City School District’s official enrollment count for the 2018-19 school year is 4,780—a decrease of 37 students compared to last year (-.8 percent decrease). The district had fewer kindergarten and first-grade students come into the system than projected, according to Business Administrator Todd Hauber. Open enrollment was closed at all schools this year, which also had an impact districtwide. He said the district has also been experiencing an enrollment bubble, which is now moving through the secondary schools. The District’s top priority is safety of all students and staff. During the winter months, schools in Park City School District will remain open, if at all possible, on all scheduled school days. Even when weather conditions are severe, every effort will be made to keep schools open in the belief that it is in the best interest of the students. The decision to close school, delay start time, or release students and staff early can only be made by the superintendent; this includes cancellation of any elementary after-school programs. When schools close early due to weather, all evening activities will be cancelled, with the exception of high school athletics and activities, which will be determined by the superintendent and athletic director. Sometimes there are exceptions to this rule; and we will notify you of these situations as they arise. By policy, head secretaries and 12-month employees, which includes principals and assistant principals, are expected to report to work as soon as it is safe to do so. This expectation is based upon the issue that we may have families who do not receive notification and may come to the schools. The District recognizes the rights of parents to make decisions that are best for their children. Therefore, the option to keep children home when weather conditions are severe is always at the parents’ discretion and the school respects the decision. An excused absence is given if the parents make the decision for their student(s) to remain home. The following information outlines the communication procedures that will be followed if such school closures or early dismissals become necessary. The district team begins monitoring weather as early as 4:30 AM by monitoring UDOT road condition reports, the National Weather Service weather conditions and patterns, and in consultation with city and county transportation officials. An additional issue is that we are dependent upon on how fast the the city and county can clear the roads. Parents and employees will be notified (via text, email or phone call) no later than 6:15 a.m. when school has been cancelled. Parents are encouraged to keep their emergency contact information updated via PowerSchool. No announcement means normal operation; schools are open, and parents will not be notified. Parents are encouraged to establish an emergency plan for their children in the event that schools are closed, or are dismissed early. Parents should instruct their children where to go or what to do if a parent is not at home. We encourage parents to have a written plan and to also share that plan with a trusted neighbor or friend to help in times of school closures. On severe weather days, understand that buses may be running late due to road conditions and/or traffic delays. In some areas, our buses may need to meet students at an alternate locations due to road conditions. Please watch for an email message regarding those locations or delayed bus routes. Parents are always asked to wait with and/or meet their students at bus stops when buses are running on delayed or emergency schedules. An example of an alternate stop location due to road conditions would be if buses were to load/unload at the bottom of Pinebrook Road at the tennis courts. All announcements are for one day only. Per District Policy 5000, any full day of school missed due to weather conditions will be made up at a later date, as published on the district calendar. In an effort to ensure accurate information is shared with the community, Park City School District is clarifying information pertaining to future bonding. PCSD, like all municipal entities, is likely to seek public funds in the future but it has no specific plans to bond at this time. The district just started its master planning process to determine the educational specifications for our schools for the next 10 years. This process is focused on the future of learning. The public portion of master planning will kickoff Oct. 29 with an Open House with master plan recommendations submitted to the Board of Education in May 2019. The district welcomes community input on the master planning process and will be transparent throughout the entire process. In an effort to control the spread of infectious diseases at school and allow students to be available for learning, Park City School District nurses want parents and guardians to follow district guidelines when deciding whether or not to send students to school. “Every effort is being made in the school setting to properly clean and sanitize our students’ work and play areas, but the best defense is prevention,” said District Nurse Suzanne Tanner. –Any temperature greater than 100 degrees. Children should be fever free, without fever reducing medications for 24 hours prior to returning to school. –Vomiting and/or diarrhea require that the student remain home until 24 hours after the symptoms have subsided without medication. 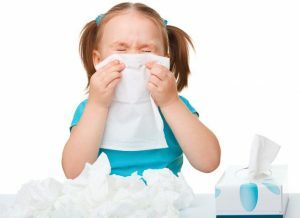 –If your child has a heavy, moist productive cough, chest congestion, or discolored nasal drainage. –Any rash of unknown origin should be evaluated and cleared by a physician prior to the student returning. –Strep infections require early treatment and students are encouraged to remain at home for the first 24 hours. In addition, students should be fever free and feeling well before returning to school. –If your child has pinkeye (conjunctivitis), he/she needs to have completed 24 hours of medication. Tanner also asks that parents/guardians notify the school of the student absences and also given a reason for the absence. “This helps us monitor disease outbreaks and disease prevention,” she said. Please refer to the District’s Guidelines for Student Illness and Exclusion for further information. Enter your name and email address to follow this blog and receive notifications of posts by email.